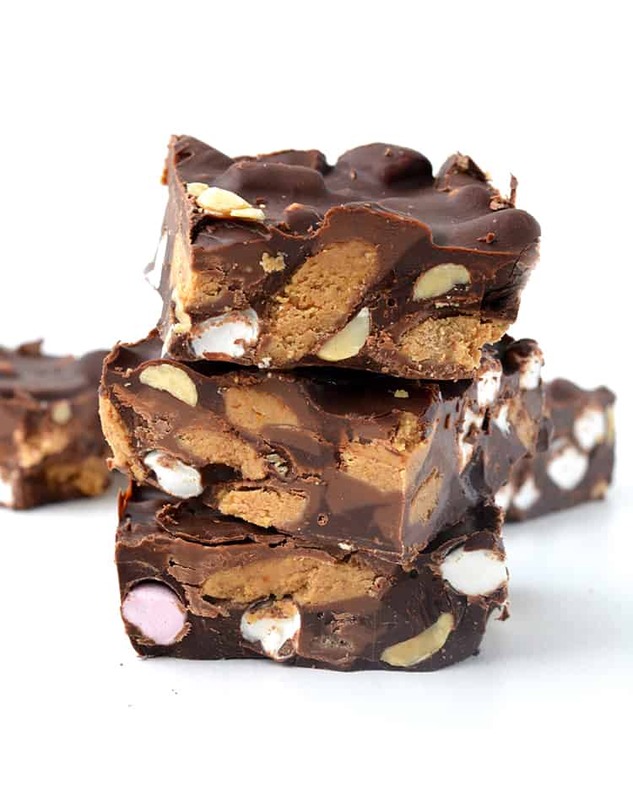 The BEST Peanut Butter Rocky Road made with just four ingredients! Delicious dark chocolate stuffed with mini marshmallows, roasted peanuts and Reese’s Peanut Butter Cups. 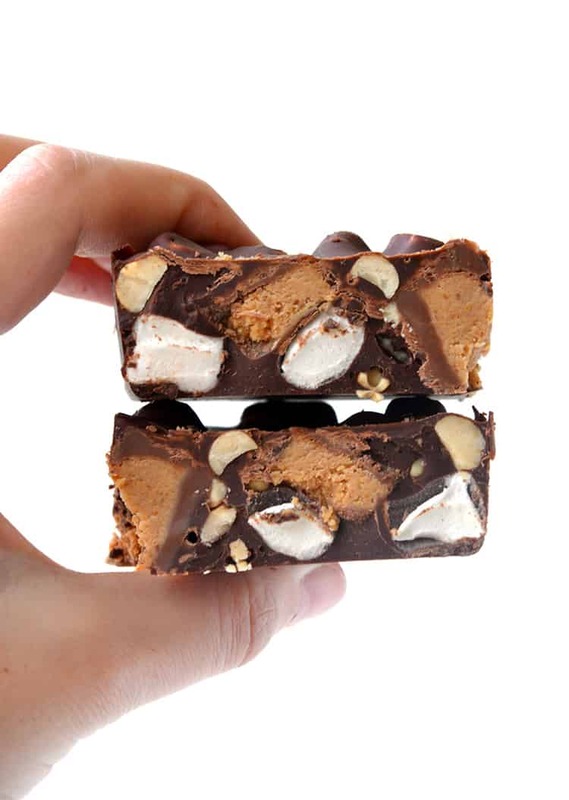 Just when you thought rocky road couldn’t get any better, we stuffed it with Reese’s Peanut Butter Cups. Salty roasted peanuts, chewy mini marshmallows and chunky Peanut Butter Cups ALL covered in smooth dark chocolate. YES PLEASE. I think I might be rocky road obsessed. I’m not sure when it started but I can’t get enough of this crunchy, salty, sweet, chocolate combo. 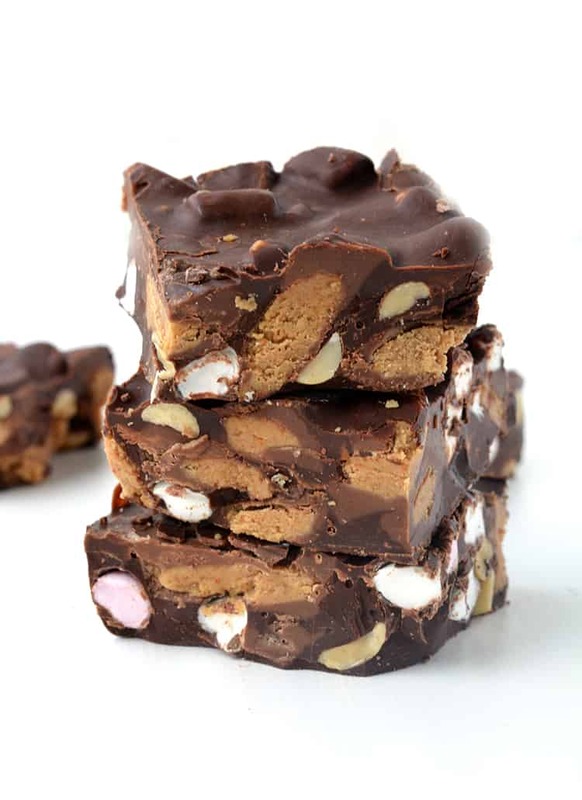 And I’m obsessed with making rocky road in ALL kinds of delicious flavours. 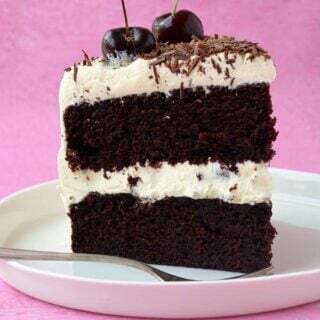 Like Cookies And Cream Rocky Road. And Nutella Rocky Road. Oooh, and campfire-inspired Smores Rocky Rocky. And who could forget the most recent Rolo Rocky Road? But today is all about that peanut butter. 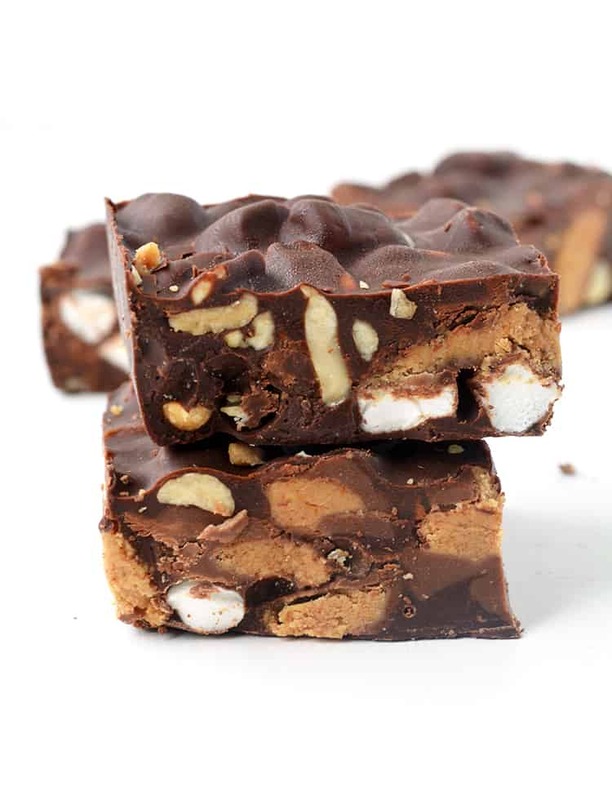 And the easiest and most delicious way to add peanut butter to rocky road? Peanut Butter Cups of course! 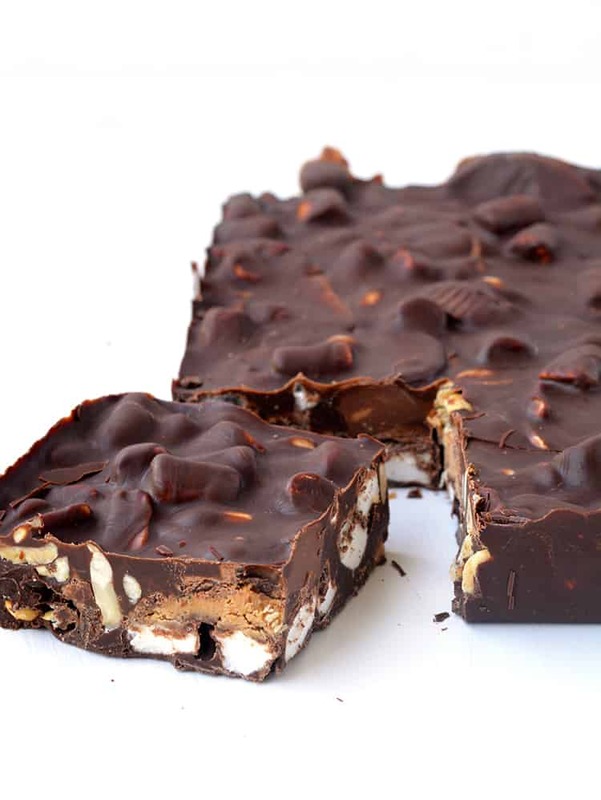 Chocolate covered Peanut Butter Cups make this rocky road extra special – trust me. That salty and sweet pb filling covered in milk chocolate is most definitely the star of this decadent chocolate treat. 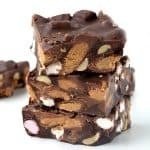 If you’re on the hunt for an easy chocolate dessert that only has 4 ingredients, you can’t go past this gorgeous Peanut Butter Rocky Road. There’s chocolate, there’s peanut butter and there’s marshmallows – you can’t go wrong. And did I mention that it only takes a few minutes to throw together? 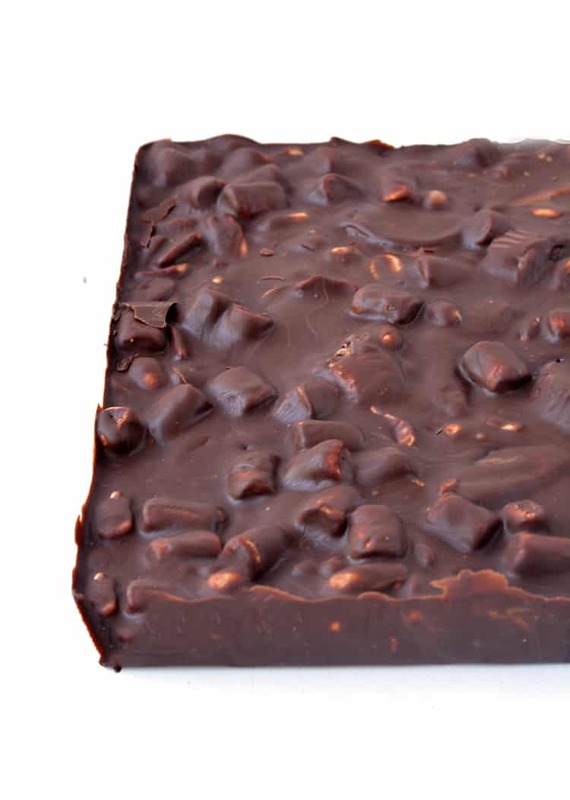 A delicious chocolate rocky made with Reese’s peanut butter cups. 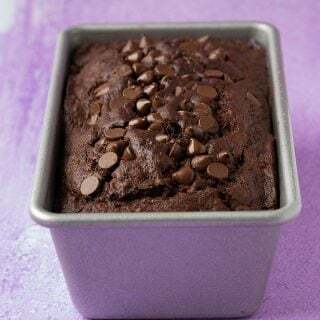 Grease and line a 8 inch square baking tin with baking or parchment paper. Break up chocolate and place in a microwave-proof bowl. Heat in the microwave, stirring every 20 seconds, until melted and smooth. Add peanuts, marshmallows and Reese’s peanut butter cups into the chocolate and stir until covered. Pour chocolate mixture into prepared tin and spread out to form one smooth layer. Refrigerate for at least one hour or set. Cut into small squares and serve. Keep in the fridge in a airtight container. These bars look so good! 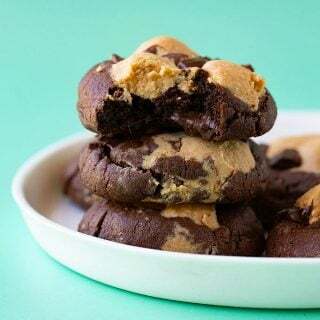 I simply LOVE chocolate and peanut butter together – the perfect combo!